Great comparison between these 3 CMS. All these platforms have empowered more than 35-40% of the eCommerce stores in the market. Magento is on the top as it cover 40-50% of the market and most of the people like to use it for their eCommerce online store. I think OsCommerce is also a good choice for your eCommerce web store. 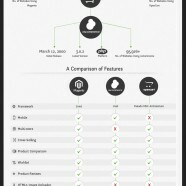 osCommerce is much better than magento and opencart. What you says ?? We find that OScommerce is quite unfriendly both for developers and shop owners and makes things far more complicated than newer eCommerce platforms.